Bird Netting Systems can be used outdoors, wherever birds are fond of perching, roosting or nesting in a particular problem area. Our netting systems come in all shapes, sizes and colors — our nets can match the décor of your building so as to be practically invisible. They can be cut to size and fit it over whole areas including canopies, bridges and signage. Bird Proofing & Control systems can provide one of the most effective ways of preventing bird access to buildings. When installed by our specialist avian teams the netting is difficult to see and can be expected to last for several years. Post wire systems involve either drilling into the building fabrication and installing posts. 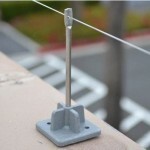 They can also be installed by using clear adhesive to attach the post into a holding unit which raises the wire systems and provide the support for the horizontal wire and springs. This post & wire system is for use to protect against pigeons and in areas where their presence is light/medium or heavy. It is ideal for new buildings as it will deter pigeons from landing. It is almost invisible from ground level and will give years of trouble free maintenance. 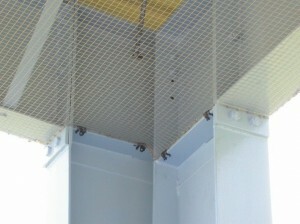 This system consists of spring tensioned wires that are suspended between posts. As the pest birds try to land feet first, they encounter the unstable wire and are deterred from trying to alight on the structure. The Europest bird spike system is a network of spike which protrudes from a plastic base. 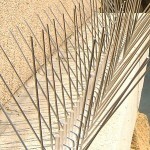 The spikes are approximately (0.30 m) long and work by reducing the area available for birds to land on. The Europest bird spike systems are normally bonded to the surface material using a strong neutral adhesive thus helping prevent the need for drilling. This is of particular use when the surface material cannot be drilled as with various signage and leaded parapet capping’s. 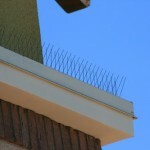 The presence of the Europest Spike system on bird alighting surfaces will force larger varieties of birds, such as seagulls, pigeons and crows to land elsewhere. The spikes come in stainless steel or plastic bird and are available from single row for narrow ledges up to wider multi row bird spikes that are more effective for heavy problem areas. The Bird Free optical fire gel is a revolutionary new bird control product which emits an ultraviolet light that birds relate to fire which discourages them to land where it is installed. Visual deterrence is further reinforced by the natural oils which are repugnant to a bird’s senses. The Bird Free optical fire gel causes no damage to the building or structures and it is placed in dishes that can be glued, magnetized or hung. Bird Free optical fire gel is oil-based so it is not affected by extremes of temperature, wind, rain or snow. Herbal oils contained in Bird Free form a film that makes it waterproof and prevents it from evaporating.